I got my tax refund last week. Now I’ve had my eye on a new toy for quite some time. I’ve actually been drooling over it, salivating mind you, waiting for the day I could plunk down my hard earned money and take it home, rip it out of the box, and play with it to my heart’s content. I even went by the store a couple weeks ago to see it in person and make sure it was the one I really truly wanted. I must say it was love at first sight. I dreamed about it night and day, waiting patiently for the time I could claim it as my very own. 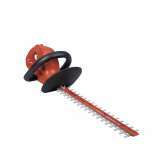 Say hello to the Hedge Hog, 20 inches of double-sided cutting power trimmer. It even comes with a warranty! I think I’m in love…….. I had a sneaky suspicion about this one – something about hedges. LOL Jordan so can I but it’s the *ahem* (not so) little things that keep us going. Hollie you’re welcome anytime, power tools or not!